I have spend a long time trying to sort this out. But I getting more and more confused. I want to burn the bootloader to create this sensor. But how do I connect the usbasp to a bare atmega328p without external crystal to burn the bootloader?? Can I connect the usbasp to the arduino unos ICSP port? The ICSP connector that is nearest to the mega328 chip is the one I planning to use. @stoffej - check this out: https://www.arduino.cc/en/Tutorial/ArduinoISP as well. Im not using the usbasp but a normal usb cable to my uno, then i use the uno as programmer. usbasp is a programmer itself and you cant use both. If you want to use the usbasp you need to connect the right pins from it to a breadboard where you have the atmega. Im sure there are more ways to do it. 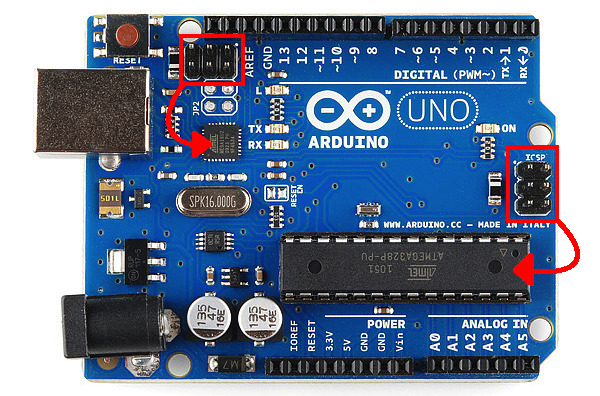 Just take out the Atmega328p from your Arduino Uno, put in a new Atmega328p, connect your USBASP and burn the bootloader. and perhaps some parts of this howto can help you too. not the same bootloader but I use usbasp. Yes you need to use your icsp conenctor or the spi port + rst pins if you want.